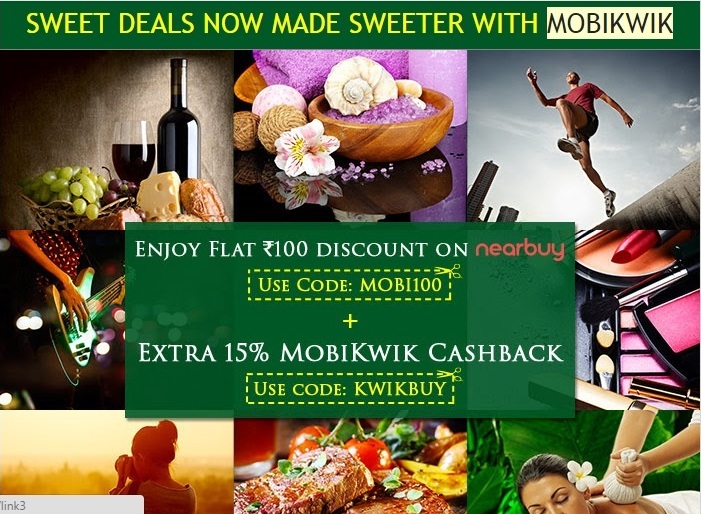 MobiKwik Flat 100 off coupon plus Extra 15% cashback offer for NEARYBY BY GROUPON - MobiKwik provides an amazing offer of flat 100 rupees discount and extra 15% cashback on NEARBUY BY GROUPON. Note - Groupon india is now nearbuy.com. Nearbuy(Previously known as Groupon India) has a lot of amazing deals and discounts from India. They have lot of discount codes from your hometown. How to avail MobiKwik Flat Rs.100 off offer with Groupon Nearby and extra 15% cashback offer? 2. Make your purchase and enter the coupon code 'MOBI100'. 3. Pay with Mobikwik wallet and use offer code 'KWIKBUY'(new users) or 'KWIKNEW'(existing users) to get extra 15% cashback. Maximum cashback is Rs.75 for new users and Rs.50 for existing users. 1. MobiKwik and Nearby's terms and conditions are applicable. 2. The offer code is valid on all local deals. 3. Cashback is 15% from MobiKwik. 4. Offer is valid till 7th October 2015. 5. There are 2 different promo codes for new(KWIKNEW) and existing users(KWIKBUY). Use correct promocode. 6. Users can redeem the cashback only once during the promotion period. 7. Maximum cashback is Rs.75 for new users. 8. Maximum cashback is Rs.50 for existing users.